My Mom has come down a couple of times in the last few weeks to help me work on the house and get organized. I have big ideas, but I'm bad at executing them. This is her area of expertise however! I wish I had a little more of what she has! The house was looking pretty great for awhile, considering that Nathan and Benjamin leave a whirlwind of paper clippings, marbles, markers, and Hot Wheels wherever they roam. For me it's easier to keep something neat and tidy when it starts out that way rather than to attack an enormous disaster area. So things were looking pretty good, if I do say so myself. And then Spring Break happened. 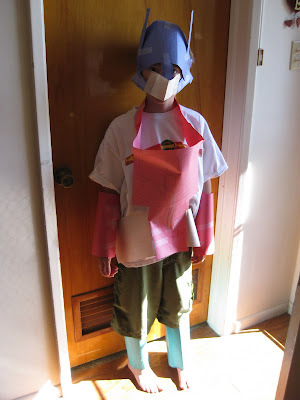 Nathan spent his first day of Spring Break creating an elaborate Optimus Prime Transformers costume out of construction paper. He was trying to figure out a way to realistically "transform" the costume. Give him a little more time, and I'm sure he'll figure it out. 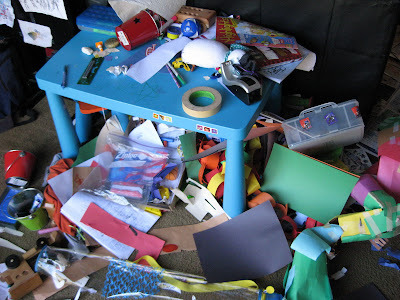 But this is what the area behind the couch (his workspace) looked like after his paper-fest. With our little jaunt to Disneyland yesterday, the wreckage has now been sitting there for three days. I guess I better get on it. Or get the kids on it. That mess isn't going to clean itself up, you know. Thankfully my parents never said that lovely phrase to me while I was growing up. They simply said keep the door to your bedroom closed.